CSEAR Reading Room, December 2015. The Centre for Southeast Asian Research (CSEAR) is one of five regional research centres in the Institute of Asian Research (IAR) at the University of British Columbia (UBC) in Vancouver, Canada. Founded in July 1992, the CSEAR is currently located in the C.K. Choi Building, one of UBC’s greenest buildings. 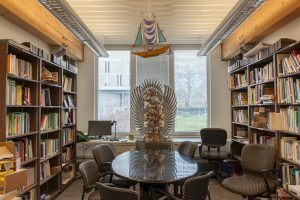 The CSEAR is the only academic institutions in Canada exclusively devoted to the study of Southeast Asia. For the past 23 years, the CSEAR has been organizing seminars, workshops, conferences and publications to promote interest in and understanding of Southeast Asia through scholarly exchange, and serving as a vehicle for the development of collaborative research projects among faculty, graduate students, and colleagues in Southeast Asia and elsewhere in Canada. The CSEAR continues to actively engage with students, researchers, and community members to promote the cultures of Southeast Asia on the UBC campus, in Metro Vancouver, and beyond. Research on Southeast Asia in UBC has a long history. UBC began offering courses on Southeast Asia in the 1960s and created an undergraduate specialization in Southeast Asia in 1988, which was later absorbed into the Asian Studies major. UBC also had a strong group of faculty with a deep interest in Southeast Asia. Well before the CSEAR’s inception, the IAR was headed by a prominent Southeast Asian geographer, Dr Terence McGee. He was the founding director for IAR and held the position for many years (1978-1992, 1995-1998). The late Dr Geoffrey Hainsworth, a well-known developmental economist, served as the first director of the CSEAR and was the President of the Canadian Council for Southeast Asia Studies for several years. A noted historian of Vietnam and China, Dr Alexander Woodside was involved in creating the Institute of Asian Research and remained as the CSEAR’s faculty associate. The faculty of Southeast Asia experts continued to grow over the years and included Dr Diane Mauzy (political science), Dr Tineke Hellwig (Asian studies), and Dr Ian Townsend-Gault (law). Profs. 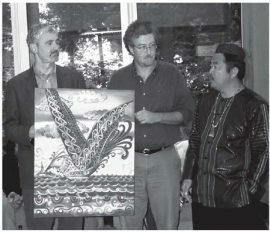 Tim Cheek and Michael Leaf accept a painting offered by artist Norbert Monterona to the Centre for Southeast Asia Research. September 2004. In 1988, UBC was also one of the founding members of Northwest Regional Consortium for Southeast Asian Studies (NWRSEAS) with the University of Oregon and the University of Washington. That year, the IAR also became a home to the Indonesia Project, funded by the Canadian International Development Agency, whose activities encompassed research, education, training and bilateral aid programs. Through the 1980s, the IAR welcomed visitors from Southeast Asia including Indonesian educators, Malaysian economic researchers, Thai engineering students, and Vietnamese social scientists. Princess Chulabhorn of Thailand visited UBC in 1989 and Prime Minister Pierre Elliot Trudeau came to the IAR to meet with UBC researchers after his visit to Southeast Asia. Community connections were already strong in the 1980s. Dr Jim Placzek, a long time research associate of the CSEAR, was a board member of the Friends of Thailand, a community group established in Vancouver in 1988, which helped organize many cultural events with the Indonesian, Thai, Malaysian and Filipino communities. Old CSEAR Logo. Asia Pacific Report, Fall 1994. Designed by Lai Wong Chow, UBC Fine Arts Department at the time. In September 1992, together with four regional research centres housed in the IAR, the CSEAR was launched with the largest following on campus made up of 49 faculty and 45 graduate students. Coinciding with the launch, the CSEAR held the CCSEAS-NWRSEAS joint conference in October; over 250 faculty and students, mainly from the US and Canada, attended the event, and there were more than 100 papers presented. In 1996, when the IAR moved to the C.K. Choi Building, the CSEAR moved to its current location in room 221, in the south side of the building. The CSEAR’s faculty associates have held leadership positions in the academic community throughout the 1990s until present. Dr Diane Mauzy served as the President of the CCSEAS from 1994 to 1996 and Dr Tineke Hellwig served as Chair of UBC’s Women’s Studies Department and Chair of the CCSEAS conference organizing committee between 2008 and 2009. The conference also honoured a long time CSEAR faculty associate, Dr Alexander Woodside. The faculty grew over the years as well. Dr Michael Tenzer joined the Faculty of Music in 1996, Dr Nora Angeles joined the School of Community and Regional Planning in 1998, and Dr Abidin Kusno joined the IAR in 2004. Over the years, the CSEAR organized a number of research conferences with partners from across Canada, the US, Europe, and Southeast Asia covering key emerging issues in the region. Notable examples: “Public Eyes/Private Lenses: Visualizing the Chinese in Indonesia and in North America,” in 2007, “The Promises And Limits Of International Criminal Justice: The “Extraordinary Chambers” In Cambodia” and “Arts, Popular Culture and social change in the new Indonesia” in 2006, “Localized Poverty Reduction in Vietnam (LPRV)” in 2003, “The Poor at Risk: Surviving the Economic Crisis in Southeast Asia” in 2000. The CSEAR also welcomed a number of visitors from the region. In 2000, HRH Prince Norodom Sirivudh of Cambodia visited UBC to give a seminar at the IAR on the future of civil society in Cambodia. cSEARching for Southeast Asia graduate conference. April 2016. More than 20 years since its launch, the CSEAR strives to promote academic research and exchange, to support community activities that contribute to a fuller understanding of Southeast Asia in Canada, and to facilitate and enhance all aspects of Canada-Southeast Asia relations. The CSEAR is an active member of the Southeast Asian community in Metro Vancouver and works closely with the Southeast Asian consular corps in Vancouver and Canada as well. Keeping in line with the CSEAR’s long-term vision to act as a hub of Southeast Asian studies at UBC, it continues to welcome diplomatic and government visitors from the region as well as academics working on Southeast Asia and a newly formed graduate student network that includes students from different disciplines. 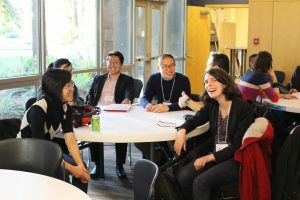 The Centre continues to hold academic events to promote intellectual discourse on the region and supports various student communities at UBC, encouraging the community to stay connected to their roots and promote the region in Canada.